Passersby are intrigued by the eye-catching display of seasoned fish fillets hanging in the Drying Room of the Fish Lab. 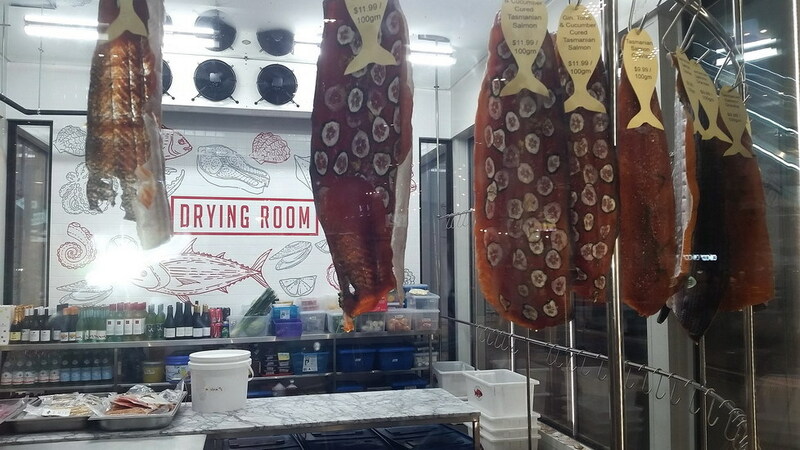 It is rare to find something this unusual on the Gold Coast, but here it is, full of tantalising promise, a tiny restaurant with its own fish smoking and drying rooms! 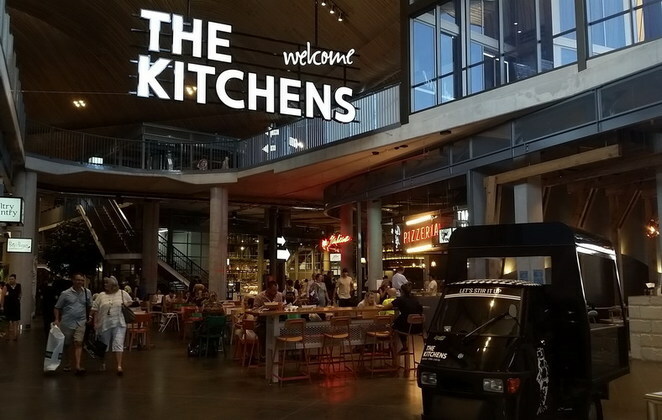 It is rare these days for a food outlet on the Gold Coast to be original, so I was excited by the prospect of a magical mystery tour of delicious and inventive concoctions showcasing these hero ingredients. 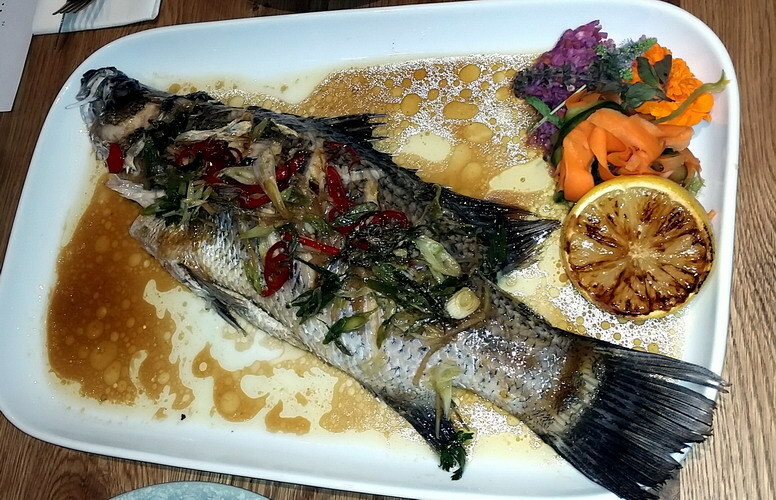 Surprisingly, the menu had very few dishes using their smoked or dried fish. The waitress explained that the fish hanging in the Drying Room was mostly for people to buy and take home, and this is an option I would definitely explore. But I was here to review their restaurant menu, and I found a winner under 'cold starters'. 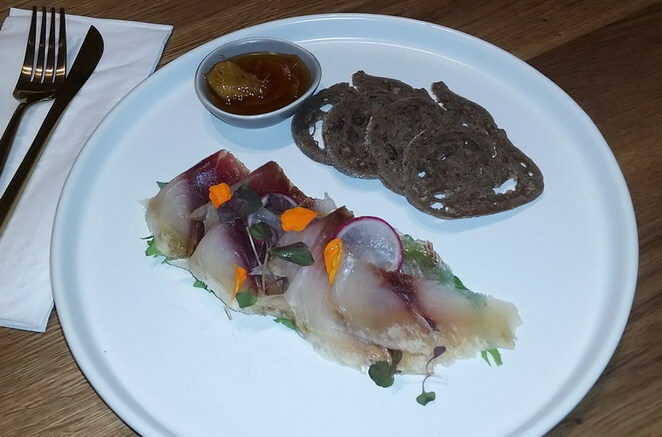 The Fish Proscuitto (dry-aged Australian Hiramasa Yellowtail Kingfish with ginger honey glaze and rye crisps) was delicious. The delicate restrained presentation belies the strong earthiness of the dried Kingfish, and proves a perfect foil for the ginger honey glaze dipping sauce. The shaved fillets have a satisfyingly rich firmness, and it is so tasty that I would have been happy with just a spritz of fresh lime juice to offset the fabulous fishiness. In the entree section, I looked for another dish that could set this place apart. Impressed by inclusion of house-made Kimchi, I ordered the Korean-inspired Spicy Fish Karaage (deep fried tuna, with Kimchi and a Granny Smith salad topped with roasted nuts, honey and lime dressing). Firm, yet tender chunks of tuna fish were deep fried and coated in a deliciously sticky spicy glaze. 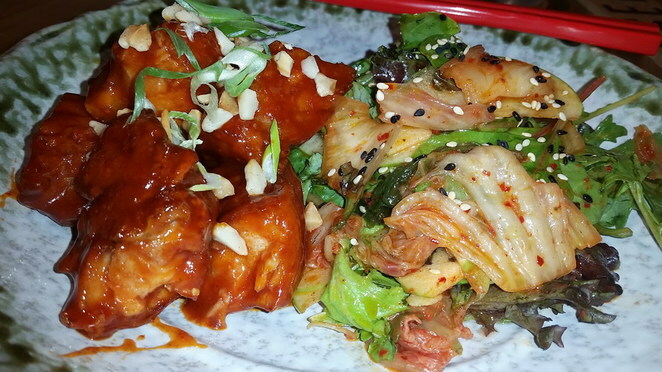 The chilled salad of spicy fermented Kimchi (made onsite) with salad greens, sesame seeds and finely shaved green apple was the perfect accompaniment. The dish had a pleasantly rustic presentation and the generous serve was full of honest flavours and very satisfying. It had everything - sweet, spice, bitter and crunch - and was good value at $20. For a main, the waitress recommended the Italian-inspired Fish Parmigiana but I opted for the Lemon Butter Poached Seafood (King prawns, whiting, scallop, diamond clam, charred leek and onion, potatoes). I found the unusual combination of flavours not to my taste, but others might disagree. All the other lunchtime diners seemed very happy with their mains, so maybe I should have tried the Seafood Basket or Steamed Whole Fish. 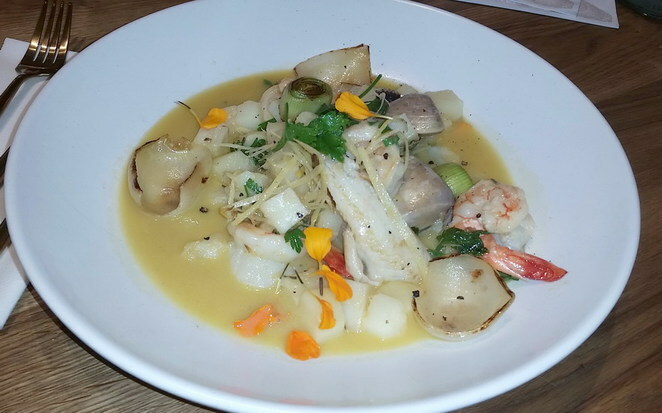 The menu is an odd mix of dishes using flavours from Italian, French, Japanese and Korean cuisines. I don't know if the Fish Lab is intentionally experimental or not, but I would hazard a guess that the cooking skills of the people in the kitchen are more aligned with Asian cooking than European. William Wu was in Brisbane the day that I was invited to review the restaurant, so I was unable to interview him. My overall recommendation would be to definitely give the Fish Lab a go. It's only been open a few weeks, so it needs a chance to find its feet. They only serve Australian and NZ seafood, so that in itself deserves our support, but do not go there expecting a cheap meal. 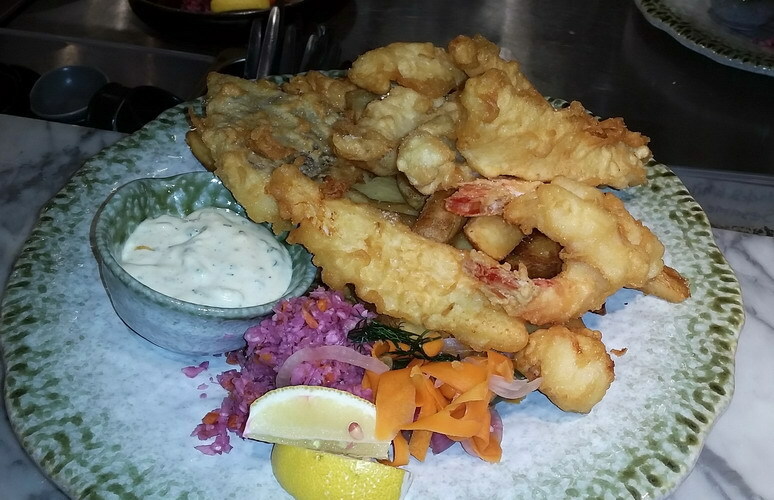 For now, I'd stick to the Asian-style dishes and those you would generally see on a pub or club menu. I'd be ordering their Fish Proscuitto, Oysters, Sashimi, Hand-Sliced Carpaccio, Tempura, Lemon Pepper Calamari, Spicy Fish Karaage, Fish n Chips, Seafood Basket, Steamed Whole Fish, or Smoked Salmon. The restaurant is fully licensed. They don't have a dessert menu as yet, but if you go there during the day there are plenty of coffee shops with tasty desserts within a few metres of the Fish Lab, so you can get your sweet fix without too much effort. The Robina Town Centre website describes The Kitchens as "A bustling urban marketplace, a community epicentre - where artisans, chefs, providores, purveyors, and food lovers come together." 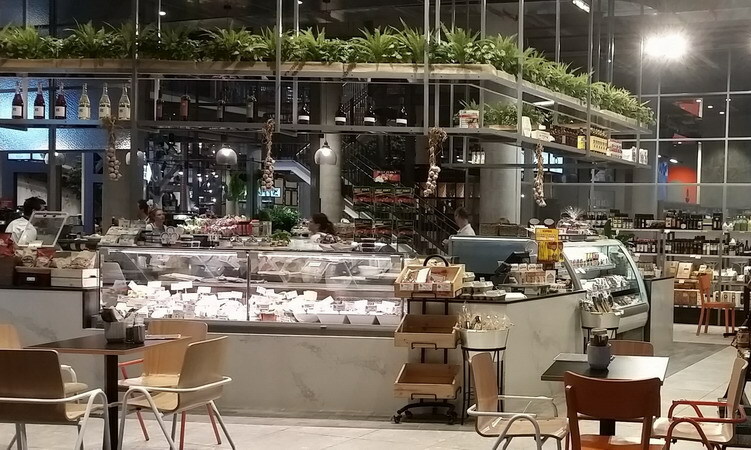 This section of the shopping centre has undergone major redesign and refurbishment, which has delivered a deconstructed notion of what a shopping centre should look like. Captured on all sides by the powerhouse triad of Myer, Coles and Woolworths, this warehouse-style space houses a mezzanine level of restaurants and a ground floor melange of coffee shops, delis, burger joints, fresh veggie shops, and even a couple of tiny street food stalls. Considering this is an area designed for shopping, eating and drinking, the distance one must walk to find the nearest toilet facilities is ridiculous! 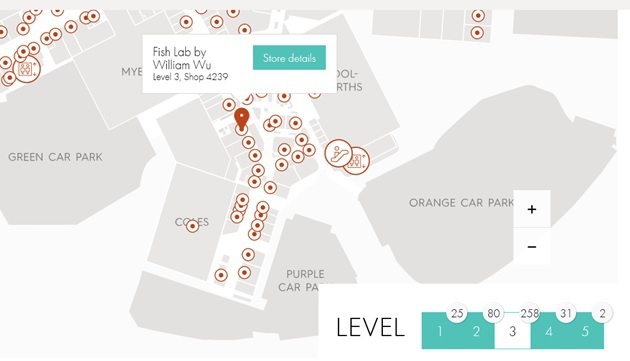 The Fish Lab is located on the ground floor, level 3 toward the back of The Kitchens, next to the escalator, and directly across from the entrance to Woolworths. Robina Shopping Centre (aka Robina Town Centre) can be tricky to negotiate and navigate unless you already know where you're going, and the renovations have not made things any easier! I suggest using a major retailer such as Woolworths or Coles as your landmark for directions. Choose the right carpark or be prepared to walk and walk, as the Centre is spread out along a number of radiating axis. There is a weekday shuttle bus for tourists, handy bus stops for locals, and lots of parking. Go to their website for maps and guides. That steamed fish looks really tasty. Bit bony though?